We have concrete experience in Google Ads and other online advertising tools (Facebook, Twitter, LinkedIn …), and we can run, together with you, your online campaigns. 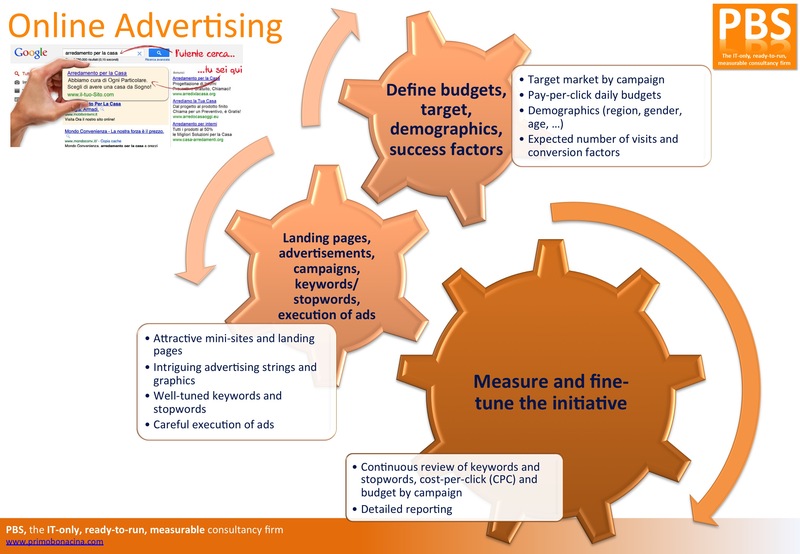 The most popular online advertising platform is Google Ads, an online advertising service that enables advertisers to compete to display brief advertising copy to web users, based in part on cookies, keywords, predefined by the advertisers, that might link the copy to the content of web pages shown to users. Web pages from Google and from partner websites are designed to allow Google to select and display this advertising copy. Advertisers pay when users divert their browsing to seek more information about the copy displayed, and partner websites receive a portion of the income they generate. Does Ads Work? Depending on the competitiveness of the keywords you’re bidding for and the relevancy of that keyword to real conversions for your company, Ads may or may not work for your business. For the most part, we’ve found that Google Ads is extremely effective for many kinds of businesses, as long as they don’t waste their money on the wrong keywords, or write weak, low CTR ads. How to advertise with Google Ads? Businesses can advertise on Google by opening a Google Ads account or delegating it. How does Ads bidding work? The actual position of your ad is determined by your ad rank (Maximum Bid times Quality Score). The highest ad rank gets the 1st ad position. Your actual CPC will be determined by the ad rank of the next highest ad below you divided by your Quality Score. The only exception of this rule is when you are the only bidder or the lowest bid in the Ads auction; then you pay your maximum bid per click! Ads bidding heavily penalizes advertisers who bid with low quality scores. Conversely, those with high Quality Scores get higher ad ranks and lower CPC. How many times does a Google auction run? The auction runs continuously and gets run billions of times each month. The results are such that users find ads that are relevant to what they’re looking for, advertisers connect with potential customers at the lowest possible prices and Google rakes in billions of dollars in revenue. How does the Google auction work? Once a query is made on Google, the search engine processes the request and runs the auction which will then determine the ad positions and each advertiser’s CPC. How do you enter a Google auction? Your ads are eligible to be entered into an auction whenever you’re bidding on keywords relevant to the user’s search query. Your bids, Quality Score, and relevance will come into play in determining whether your ad qualifies to display on the SERP (Search Engine Result Page). What gets entered into a Google auction? Once advertisers identity keywords they want to bid on, Google then enters the keyword from your account that it deems most relevant into the auction with the maximum bid you’ve specified as well as the associated ad. What is CPC? CPC, or cost per click, is the amount an advertiser pays each time someone clicks on their Ads. How does CPC work? Your CPC is determined by the competitiveness of your keywords, your maximum bids, and your Quality Scores. Learn the most expensive keywords in Google Ads. What is average cost per click? The average amount you spend each time a searcher click on your advertisement. How does Google determine what you pay? The price paid by the advertiser is determined by the amount of clicks that the company’s advertisement receives. What is Google ad rank? Google ad rank is the position of the company’s advertisement on the search engine page based on a combination of the company’s maximum bid and quality score. Ad rank vs. Quality score? The ad rank is more significant to an advertiser because it determines the how high on the page the advertisement will be displayed. Quality score on the other hand is determined by the relevance and usefulness to the searcher and is only a portion of the advertisement positioning process. Quality score vs. CPC? Quality score and CPC are important because they collective determine the positioning of the advertisement on the search engine results page. What is ad position in Ads? Ad position is the position on the search engine page results where the advertisement appears in relation to all of the other advertisements. What is Actual CPC? Actual CPC is the amount an advertiser pays each time a searcher clicks on their advertisement; this number varies depending on the other advertisers in the auction and is always lower than the maximum bidding price. How does Ads calculate Actual CPC? Actual CPC is determined by dividing the ad rank of the competitor below them (ad rank to hit) by quality score plus $.01. What are Ads keywords? Keywords in Ads are the words and phrases that advertisers bid on, in hopes that their advertisements will appear on the search engine results page (SERP) when people are searching for those products or services. For example, if you sell shoes online, you might bid on keywords like “Nike sneakers” and “penny loafers.” Keyword research is the process of using tools and data to determine which keywords are most likely to drive relevant traffic to your ads and your site. How does the Google display network work? The Google Display Network or GDN is a very large network of sites that allow Google to place display advertisements, which reach over 90% of all Internet users! Advertisers generally find that Display Network clicks are less costly than those on the search network. And depending on your targeting methods, the CTR’s can be high and the CPA’s low. What is an ad group in Google Ads? How do ad groups work? An ad group is a container for your Ads advertisements, keywords, and landing pages. Google tends to reward advertisers who create Ads campaigns with tightly structured ad groups. It’s important not to dump all your keywords into the same ad group, but to organize your keywords into themes. What is ad relevance in Ads? Ad relevance is a measure of how related the keyword you’re bidding on is to your advertisements as well as how much your keywords match the message of your ads and landing pages. Higher ad and keyword relevance can improve your click-through rates and Quality Scores. All at a fixed, all inclusive “per month” consultancy cost. Here follows more info on this service. Click on the image below to enlarge it!